WHO’s new registration system will enable it to build a global roster of foreign medical response teams ready to deploy for emergencies. With global crises on the rise, the United Nations World Health Organization (WHO) today announced that its new registration system will enable it to build a global roster of foreign medical response teams ready to deploy in response to tsunamis, typhoons, floods and outbreaks, such as Ebola and cholera. The Global Foreign Medical Teams Registry – which goes live today – sets minimum standards for international health workers and allows teams to clearly outline their services and skills. This facilitates a more effective and predicable response, and better coordination between aid providers and recipients. If preregistered with the WHO global registry, medical teams will be expedited and allowed in to the country to help those in need. “Thanks to the system we have developed, the international response to the cyclone in Vanuatu has been very fast and efficient,” said Dr. Ian Norton, who leads the work on foreign medical teams at WHO. The standards developed by WHO build on lessons learned during previous emergency responses including the West African Ebola outbreak, for which WHO coordinated the deployment of nearly 60 foreign medical teams provided by 40 organizations. It was the first time that foreign medical teams were deployed during an outbreak. Most recently, the WHO assisted in the vetting of medical teams responding to Cyclone Pam in the remote Pacific Island of Vanuatu. “We supported the Ministry of Health to ensure that every foreign medical team that arrived in Vanuatu was registered in the system and had the right training and equipment. This meant that teams have been able to provide care quickly and effectively to the people most in need,” Dr. Norton added. The first medical team arrived from Australia to support the local health workers just 2 days after the cyclone hit. Since then, 20 teams – more than 50 doctors, 40 nurses, 24 paramedics and 12 midwives – have provided assistance. New teams continue to arrive to fill positions as other teams return to their home countries. Under the new registry, medical teams are required to self-sufficient for the first two weeks – including food, shelter, water and medication for their team and for themselves. Last year’s Ebola outbreak in West Africa also called for unique medical knowledge and equipment, and has carried risks for health workers. Progress that has been made against Ebola is in part due to the response by the national and international teams working together in 72 Ebola treatment centres across Sierra Leone, Guinea and Liberia. In previous responses including the Haiti earthquake and the South Asia tsunami, some foreign teams arrived without informing the national health authorities or coordinating with other international responders. Although well-intentioned, sometimes these people lacked appropriate skills and local knowledge, were unfamiliar with the international response systems and standards, or brought inappropriate equipment that did not match the health needs of the people. “The issue really came to a head in Haiti in 2010 with the response to the Haitian earthquake and the arrival of multiple medical teams, estimated up to 300, without self-sufficiency, without a coordination mechanism and the chaos that ensued,” Dr. Norton said at a press conference in Geneva this morning. For this reason, the WHO set up the blue book of classifications and minimum standards that seeks to identify foreign medical teams – more than one or two medical workers, be doctors, nurses, paramedics, physiotherapist, that go from their country into another in an emergency. This includes charities, non-governmental organizations and government teams as well. “Classifications allow the team to declare and the country to realize what they are offering,” he said, adding that the standards were published in May 2013 and within two months were used in the Philippines response to Typhoon Haiyan. “It has been proven in the field with 151 teams responded to the Haiyan Typhoon and within about three days the Ministry was informed about the classification system. They then issued a declaration to all arriving teams that they must register with the department of health,” he added. Improving the global response to emergencies has benefits for all countries, Dr. Norton said, emphasizing that it will help build skills and capacities of national teams to respond to their own emergencies and eventually be better able to help other countries. WHO is also developing best practice guidelines and standards for teams to respond to specific needs including care of children, pregnant women, patients with disabilities and older people. In related news, the UN Department of Public Information (DPI) and AudioNow Digital, a leading provider of in-language mobile apps for radio broadcasters, today announced that audio content featuring United Nations coverage on the Ebola epidemic will now be accessible through UN Radio’s Global Ebola Response mobile application. The latest news bulletins and updates on Ebola’s impact and the efforts to address it, as well as archived audio stories, from the UN's multimedia teams are available in the six official languages inside the app: Arabic, Chinese, English, French, Russian, and Spanish. Additional coverage is available in Kiswahili and Portuguese. “We are excited to expand further our partnership with AudioNow through the launch of this very timely mobile app. Despite the progress made, the Ebola crisis is far from over, and this app will inform stakeholders and the general public about ongoing international efforts on the ground to contain and eliminate this epidemic,” said Hua Jiang, Acting Director, UN News and Media Division. 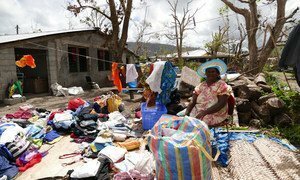 Two weeks after Tropical Cyclone Pam struck Vanuatu, the United Nations Humanitarian Coordinator for the archipelago on a tour through one of the most severely affected provinces Saturday, warned of a “secondary emergency” and urged a scale-up in efforts to provide the essentials to people in need.